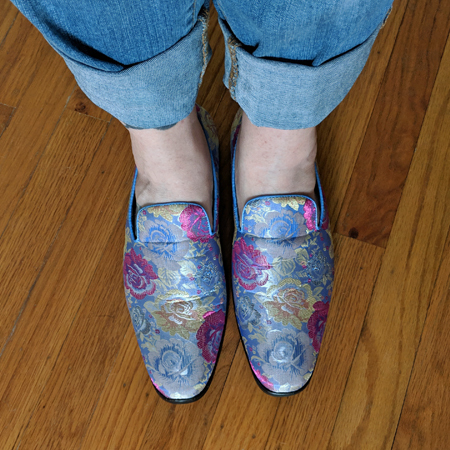 These are actually men's loafers — the lavender Swank by Stacy Adams. (Even the name is terrific!) This is my first pair of Stacy Adams loafers, but I really like the brand, because they usually come in men's sizes small enough to fit me. And these loafers are quite comfortable and look even better in person, so I'll probably go back. In the meantime, I'll content myself with drooling over these beauts — the lavender Dandy. Siiiiiiiigh. It's nice to have a brand of men's shoes that work for me, which broadens my options in loafers and oxfords. I prefer women's shoes with a menswear look, but that's a more limited selection even across thousands of brands than I'd like. Also: Just a great selection of less traditionally masculine shoes for men who want some fem-leaning options. So yay Stacy Adams!